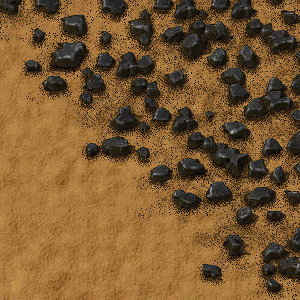 Coal is a resource found on the map. It can also be found inside huge rocks. It is used as fuel in burner machines and boilers. It can also be used in locomotives, tanks, and cars; as a fuel source. It is also a component in several weapons (such as grenades) and plastic bars. Coal liquefaction now takes steam instead of water. Added use in coal liquefaction. Slightly more coal is generated per world. Color of the ore on the map changed. This page was last edited on 3 April 2019, at 21:26.